My French copy of My Lord and Spymaster is out from J'ai Lu. Lovely cover. Just lovely. This translates as 'The Master of My Heart -- which makes a bit more sense than 'My Lord and Spymaster'. Just IMO. Love the title & love the cover, but why do you think the title is better? I'd like to know your reasoning. And did you choose the title "My Lord & Spymaster" or did the editor/publisher? The cover is just beautiful (even if the hair color is off)- I absolutely love it. Skittles- I'm guessing the title is better because Sebastian, the hero of the book was neither a Lord nor a Spymaster but he certainly did become the master of Jess's heart! I really love My Lord And Spymaster and I hope that some of the people from it pop up at least peripherally again. For some reason the scene with Jess and Adrian on the stairs just moves me so much. That one sentence from Adrian tells me more about him than another author could have done with a whole chapter. The scenes in the Pading Ken are amazing too. Normally I am rushing through the parts of books that don't deal strictly with the main characters but I found Lazarus and his world riveting as well. I've thoroughly enjoyed learning little bits about the characters through all the books. And of course Jess and Sebastian are perfect. Can you tell how many times I've read and enjoyed this book? Lol. I love the Adrian-on-the-stairs scene myself. I know it's not in the direct line of the story . . . but I do think we should be allowed to digress a bit. 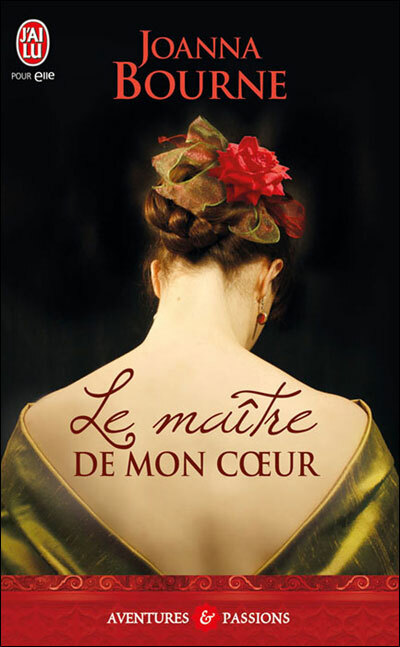 I am going to say something complimentary about French covers. They have impact. And they're not afraid to put a strong face -- or in my case a back -- central to the design. Maybe it's just my imagination . . . I don't think it's your imagination. The French covers have much more saturated colors, focus more on one person or element and aren't afraid to have the people on the cover make direct "eye contact" with the viewer. I've noticed a trend in US covers where there are a lot of headless bodies on covers, or heads chopped off mid face to focus just on the body. There are also a lot with just a pastel field of flowers. The French covers seem more striking in general and would catch my attention on the bookshelf if I were passing by. The French don't seem to go in for clinch covers, either. I don't have a huge sample to go by, of course . . .
Omigoodness, Jo--that cover is just gorgeous! Isn't it pretty and sophisticated? I do like it. I wonder if it's some painting I'm not familiar with . . .